Provide comfort for the family of Hal Olsen with a meaningful gesture of sympathy. Hal Nelse Olsen, age 74, passed away January 19, 2019. He was born July 4, 1944 in Lansing, the son of Ray and Beta Olsen. 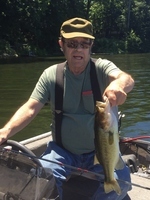 Hal was a lifelong resident of Hastings where he enjoyed fishing and spending time with his sons and grandchildren. He took pleasure in the simple aspects of life and always said the nation celebrated he and his granddaughter Alyssa’s birthday. Hal was the owner and operator of Hastings City Cab and retired from the Viking Corp after 36 years. Surviving are his sons, Marty (Jennie) Olsen and Cory (Amy) Olsen; grandchildren, Rachel, Merlyn and Maddie Olsen, Cody (Nichole) and Alyssa Olsen; great grandchildren, Sophia and Charlie Olsen. He was preceded in death by his parents. Friends and relatives may meet with Hal’s family on Sunday, January 27 from 2 to 4 P.M. at the Williams- Gores Funeral Home in Delton. Memorial contributions may be made to the Barry County Humane Society, PO Box 386, Hastings, MI 49058. Please visit www.williamsgoresfuneral.com to share a memory or to leave a condolence for Hal’s family. To send flowers in memory of Hal N. Olsen, please visit our Heartfelt Sympathies Store. Donations are being accepted for: Barry County Humane Society. We encourage you to share your most beloved memories of Hal here, so that the family and other loved ones can always see it. You can upload cherished photographs, or share your favorite stories, and can even comment on those shared by others. Provide comfort for the family of Hal N. Olsen by sending flowers.